When were tombs first built? The Valley of the Queens is where many of the wives and family members, including Princes and Princesses, of famous Pharaohs of Ancient Egypt were buried. Ravaged by tomb robbers the most famous of all the tombs in the Valley of the Queens was that of Nefertari. The Valley of the Queens is a necropolis which is defined as a large cemetery or burial place near the sites of the centers of ancient civilizations. The necropolis is located near the Ancient Egyptian city of Thebes (now modern-day Luxor). The Valley of the Queens is located near Luxor which, in Ancient Egypt, was called Thebes. Thebes was the capital of the Ancient Egyptian dynasties during the period of the New Kingdom. Thebes stood on the eastern bank of the River Nile and was the centre of worship for the god Amun. Opposite Thebes, on the Western bank of the Nile, is where the Valley of the Queens is located near to the famous Valley of the Kings. The Valley of the Queens is set in a remote southernmost area of the Theban necropolis. When were tombs first built in the Valley of the Queens? Tombs for royalty and nobles were built in the Valley of the Queens during the period of the New Kingdom (1570 BC - 1070 BC) and served as burial places for the wives and family members, including Princes and Princesses, of famous Pharaohs during the 18th - 20th Egyptian Dynasties, a period of 500 years. There are over 100 tombs and funerary wells which have been discovered in the Valley of the Queens. This area was also used as a burial place for the Ptolemaic and Greco-Roman period of Egyptian history. 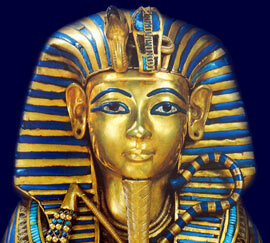 The most famous tomb in the Valley of the Queens belongs to Queen Nefertari, the beautiful wife of Ramses the Great. Nefertari died when she was 47 years old and her tomb is regarded as one of the most beautiful in Egypt - QV no.66. Each section of the Valley of the Queens addresses all topics and provides interesting facts and information about the Golden Age of Pharaohs and of Egypt. The Sitemap provides full details of all of the information and facts provided about the fascinating subject of the Pharaoh - Tutankhamun and the Valley of the Queens!